The summer before I turned twenty-one the family I worked for started talking about selling General. I couldn't contemplate staying there without him so I decided to use it as my cue to move on. It was easier in the summer than it would have been in the winter as General was turned away so I wasn't spending much time with him. A lovely family had fallen in love with Rocky and had been asking to buy him for some time. That gave me the money for a little breathing space so I moved Ben to a big livery yard nearer to home while I decided what to do next. There were over forty horses and ponies there and I loved having so many people around after working mostly on my own for the last few years. There was also that undreamt of luxury - an indoor school, which I made full use of, along with the wonderful forest trails. After a few weeks the girl who had been running the yard decided to give up horses and get a proper job and I was offered the post. I snapped it up, moved into the on-site mobile home and worked ridiculous hours, often from 5 in the morning until 7 or 8 at night. I loved every moment and no-one could get me to take so much as one day off! 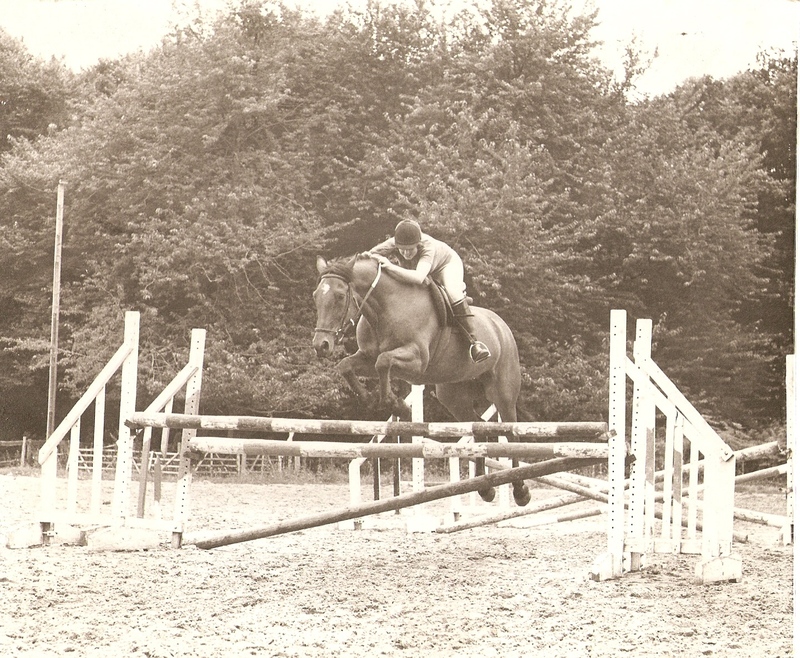 I was offered the ride on a 15.3 bright bay seven year old gelding called Robert. He had been having some fun with his previous rider and it had got to the point where he refused to even leave the yard. I put him in long reins and drove him in and out, and up and down the road for a bit, and then rode him out looking for things to test out our new found forwardness. He was a pussycat really and very quickly decided his previous game was a waste of energy and from then on nothing phased him at all. I soon discovered that he loved to jump and he soon became the most willing horse on the planet! We started small and worked our way up to 3'9" opens but they were a bit too big for me, as I don't have a reliable enough eye for a stride, so we settled on courses of up to about 3'3". The only problem I had to to begin with was getting Robert into a lorry but, when all else failed, I decided to try riding him in and it worked like a charm. He enjoyed the shows so much that he soon became eager to load, trotting enthusiastically up the ramp, and it was never again a problem. 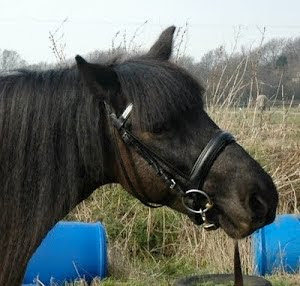 Robert was a very sociable horse and loved shows and being in a crowd. 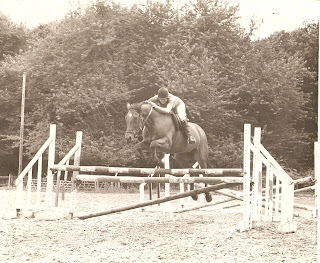 Robert and I jumping at home - that looks HUGE to me now!!! A couple of years later I was offered Jonesy on permanent loan. I'd looked after him at the hunter yard for a while and had always liked him so I jumped at the chance. He quickly became Ben's best friend and I took my two horse team to shows together. We always had at least one full lorry going to shows from the yard, and sometimes two, and it was really good fun. I'd certainly achieved the ambition of my teenage years! I met my late partner just before the owners of the livery yard decided to apply for planning permission to convert all the stables into houses. He offered me the chance to start my own livery yard here and it was perfect timing. I came to have a look at the place and basically never went home! Ben and Jonesy had pride of place and a new chapter began. When Ben and Jonesy started to get old I acquired two more ponies, a beautiful 14.2 palomino mare called Kelly and a little 13.3 bright bay mare called Rosie. I really bought Rosie to break in and sell on but couldn't bear to part with her. We put her in foal when she was 4 and bred Russell, who is still here today, now well into his twenties. Kelly was the perfect show pony but she preferred to keep her feet on the ground so I mostly stuck to showing and unaffiliated dressage with her. 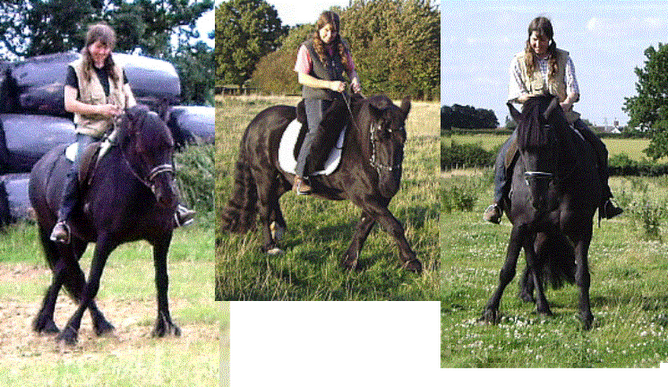 Rosie loved to jump but didn't have a lot of scope so we just had fun around small courses. 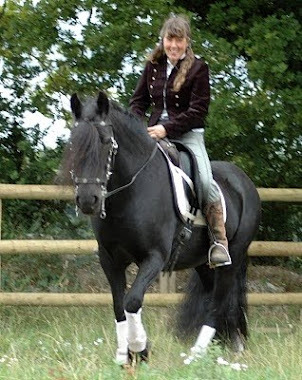 Russell is a beautiful mover and did very well in unaffiliated dressage competitions but he was a bit too narrow for my liking and we always seemed to have unfortunate things happen which always resulted in my hitting the deck. For example, I was warming him up at a show once and a heavy jump stand blew over just as we were trotting past and hit his hind leg as it fell. He understandably shot sideways, catching me totally by surprise, and I fell off and dislocated my index finger. Little things like that always seemed to happen, even out hacking, and they ate away at our confidence in one another. He was incredibly quick and athletic and, in an effort to try and sit his sudden manoeuvres, I read everything I could find about improving my position and worked really hard at it but the harder I tried the stiffer I became and the more easily I fell off. Eventually neither of us was enjoying it at all any more so I stopped riding him. Luckily he is very sociable and kind with other horses so he's always performed an invaluable job here as a companion to youngstock, Rico being the latest. He took very good care of Bella for years after she arrived here as a yearling and I owe him big time for that alone! When Kelly and Rosie started getting towards the end of their lives I found Bella, and a year later I was offered her half brother, Jack, at a price I couldn't refuse. Bella and Jack, with their huge personalities, led me to clicker training. I guess I'm documenting all of this here to show that, pre-clicker, I was muddling along OK with horses, if you leave Russell out of the equation, I enjoyed a challenge and mostly managed to find ways to get horses on my side and co-operating. I turned to clicker training specifically to try to fix two problems - Jack being so lazy to ride and Bella's reluctance to accept the bit properly. I had NO idea of the power of the clicker and how it was going to revolutionise everything I did with horses, and beyond, and open up a whole new world of possibilities. I found out all of that very quickly and it's allowed me to achieve things I could never have dreamed of before. It really has changed my life, and my horses lives. It's given me so much more empathy with them and really opened my eyes to just how incredibly sensitive and intelligent horses are. It's allowed me to communicate clearly and precisely with my horses and opened up a two way dialogue between us. And, best of all, it's given us SO much fun and sheer, unadulterated joy along the way. Thank you!! Sorry I disappeared for so long, but I did catch back up on what I missed. I can't wait to read more about Rico. :D He's so gorgeous and his personality sounds a lot like Chrome.